I saw a sight today that took be back to my school days. I saw my first corporal punishment during my twelve weeks here. I’m not going to defend or justify it but just to say it is the way out here. Mr Mmari was out supervising the assembly and at the end, as Nuhu out of Form I and Tumaini out of Form III, walked past him, they quickly put out their hands and received two flicks of the cane on their palm. If I had blinked I would have missed it and that is most likely what has happened during previous incidents since, on this occasion, their crime was that they were late, and certainly they are not the first this term to commit that sin. I won’t dwell on it, only to say that, although it is not my style, it certainly does not affect the atmosphere around the school as the relationships and good will between staff and students are excellent. 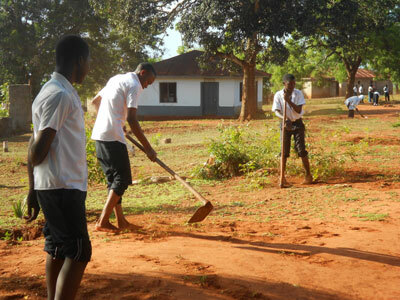 If I knew what was in store for the morning, I think, in their shoes, I might have been late as well because, upon arrival, they were given either an adze or a brush and the job was to clear the rough grass from a stretch next to the school where it was hoped to plant flowering bushes. A good idea if you don’t also keep goats that tend to eat the flowers anyway. 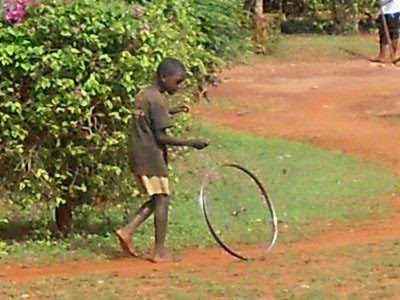 Whilst the students were working I looked towards the hall and saw another reminder of earlier times as I saw a young boy playing with a wheel and stick. I came upon Peter working in one area of the school and he asked if I had seen the snake. It appears that, as the boarders were sitting watching a small television they have in the hall, a large snake appeared inside the room. This is the same room used for examinations so if it is open to chickens, it is open to anything! I asked if it was a poisonous snake and he replied, “We didn’t stop to ask. We killed it with stones.” My thoughts went back to a talk I heard in Kenya some years ago where the speaker, who ran a local snake farm providing anti-venom serum, reported that he and his team were trying to encourage locals not to kill none-poisonous snakes as they served a purpose in the scheme of things by keeping down vermin like mice and rats. 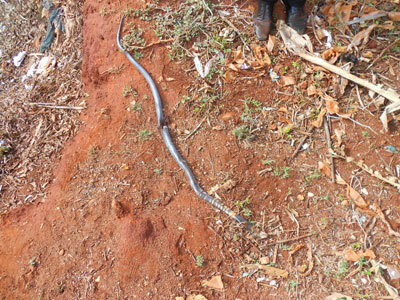 If they were killed the extra food availability encouraged the more dangerous snakes to come out of the forest. Peter took me to the rubbish area where the snake had been dumped and I must admit I might have been on the side of the students. The pair of size 10s at the top of the picture give some idea of scale. School finished for the day at lunchtime so an early return to the YMCA and time possible to answer another of Caroline’s questions. She asked if the students study Tanzanian history. The answer is yes, although there is little written record before colonisation. They do cover what tribal history there is and also the history of slaving and German and British involvement in the country. There is also a lot of history about the involvement of the Arabs and the general politics surrounding Tanganyika and Zanzibar. In Form IV they move on to do modern 20th century world history particularly the two world wars. I’ve run out of money again, so Tanga bound tomorrow.